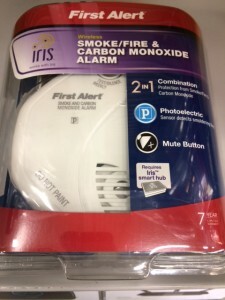 Properly installed carbon monoxide detectors may save lives! However, there are different schools of thought on where to install carbon monoxide detectors. Unfortunately, there is not always a clear cut answer. Most commonly, carbon monoxide detectors are installed on or near the ceiling and at least 10-15 feet away from combustion appliances. Areas of installation are typically outside bedroom hallways, interior garage hallways 10-15 feet from the interior door, basements, and 10-15 feet away from gas fired appliances, such as: ovens, stoves, water heaters, and furnaces, gas and wood-burning fireplaces. Digital carbon monoxide detectors are typically plug-ins and are installed closer to the floor, where most outlets are located. Contrary to popular belief, carbon monoxide has a specific gravity of 0.9657 and is slightly lighter than air, which has a specific gravity of 1.³ Science and common sense suggest a lighter gas will rise faster than a heavier gas, hence, the reasoning behind placement of carbon monoxide detectors on or near the ceiling. I’m of the school of thought that there are other factors such as: proximity to the source of the carbon monoxide, temperature, pressure, relative humidity, air infiltration, etc., that can play a role in determining where the carbon monoxide will be detected first. That said, I prefer to err on the side of safety and install carbon monoxide detectors high and low. Take a look at the chart below for an understanding of carbon monoxide’s effect on the body. When in doubt, contact your local fire department for the best up-to-date information. Carbon monoxide detectors typically have a useful life of about 5 years. If you are looking for the best performing detectors, you may want to check Consumer Reports at www.consumerreports.org. Builders and contractors should also check the International Building Codes, State and Local Building Codes. The web is good source of information, but as you know, there are a great deal of opinions that should be verified by credible sources. Good luck and be safe! Pete Hernandez is a Broker/Realtor® with the Hernandez Group at Keller Williams Pinehurst. He is a Building Performance Institute (BPI) Building Analyst and Envelope Professional with a strong interest in building science and extensive hands on experience in energy efficiency, insulation and moisture management in residential construction. He can be reached at mailto:pete@rachelhernandezrealtor.com. The above article is a public resource and contains general information that is not guaranteed to be accurate or up-to-date. The information contained in this article is informational in nature and may reflect the opinions of the author. When in doubt, always consult a subject matter expert in the field in question and perform your own research.